Saumitra Chandratreya is a Fiber-Installation artist who lives in Chicago, IL and Largo, FL. He was born in Mumbai and he considers Bangalore, India as his other home. He graduated from the School of the Art Institute of Chicago in 2017 with a degree - Master of Design in Fashion, Body and Garment. He has a BFA in Textile Design from the Srishti Institute of Art, Design and Technology in Bangalore, India. 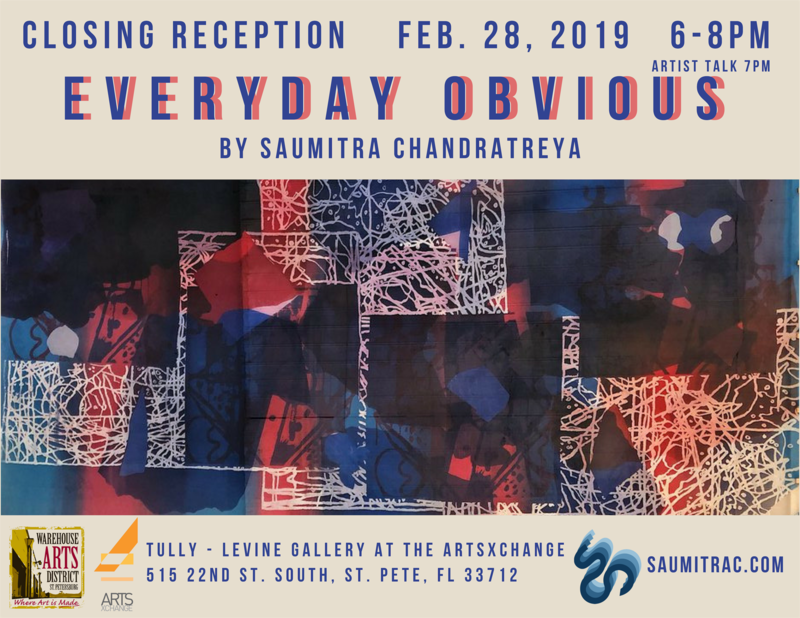 Chandratreya was awarded one of the Emerging Artist Grants from Creative Pinellas in 2018. He was one of the Finalists who exhibited at the Union League Club of Chicago for Luminarts Cultural Foundation Visual Arts Fellowship Show. Chandratreya was awarded the Shapiro Graduate research fellowship at the School of the Art Institute of Chicago and was nominated by his department for the James Nelson Raymond Fellowship while studying at the School of the Art Institute of Chicago. "As an immigrant to the United States I look at the current American ethos of hyper polarity through the lens of my own identity, which was cultivated growing up in 1990s and 2000s in a diverse democracy. My upbringing gave me tools to critically think about my social discourse. I walk the fine line of being an observer and a participant in my new environment. My art has evolved over the years to engage more with my immediate social roles and as a result, I have started using everyday, ordinary objects that are meaningful to me with textiles that have been a part of my assemblage. I derive my images by analyzing the mainstream media, using data from public sources and translating that data as abstract prints and woven pieces. I create abstract images, decorative overall patterns and text heavy pieces. I use formal as well as colloquial gay language in my text pieces. Current social commentary and pop culture play an important role in informing my practice. I believe that textiles are a versatile medium for contemporary art. I like molding them to create objects, sculptural pieces, wall mounted pieces and installations. I have an affinity for transparent and translucent materials and ordinary materials that aren’t associated with fine art. My art is experiential and it engages with a space uniquely. The objective of my art is to inform and to have a discussion by making apparent what isn’t. Contemporary art enables me to weave in various mediums to achieve a goal or to embark on an exploratory journey. I believe in the power of art and its ability to impact popular opinion and bring about social change. I think about contemporary art in the context of everyday and I want my art to reach across barriers, tactile and emotional."